This week I have a savoury bake for you, praise Mary (Mary Berry, that is). After Christmas I'm afraid I was sick to the back teeth of sweet treats and craving savoury food. So instead of making an all-singing, all-dancing, cake bedecked in bunting and fireworks for the New Year's Eve party I tripped off to on Wednesday, I took a pie. It wasn't any old pie. It was a beautiful pie. As you can see I cut mint leaves out of pastry to decorate it and egg-washed it til it shone. It was filled with a mashed butternut squash, feta, mint and shallot mixture that was topped with a layer of grated courgette. Then someone (mentioning no names, you know who you are) picked up the pie with both hands and bit into it. I was so distressed I forgot to take a picture of the cross section and could only stand rooted to the spot, gibbering the same rude word repeatedly. So let that be a lesson to you - keep your baked creations away from drunks, they will not treat them with the respect they deserve. Now, two baking points. The more experienced among you may have noticed from the textured experience of the pie crust that there is in fact some wholemeal flour in the hot water crust pastry that I used. I would love to say this was by design but in fact I just ran out of plain white flour. If you want to use some wholemeal flour in your pastry mix feel free but let me sound a note of caution. I found it made the pastry more difficult to work and this is not really what you want with hot water pastry, which becomes harder to work as it cools. Secondly, there was a flaw in my pie, which is that the grated courgette was not quite dry enough and made a soggy patch in the pastry. When using grated courgette in a pie you really do need to squeeze it for all you're worth to get as much moisture out as possible. Or you'll get a soggy bottom. On the pie, that is. Will serve six to eight people, depending on how hungry they are. 1. Preheat the oven to 200C. Wash and coarsely grate the courgettes. Place in a colander, sprinkle well with salt and leave over a sink. 2. Melt the butter for the filling over a medium heat and add the butternut squash and shallots, turning over with a wooden spoon to ensure they get well coated in the butter. 3. Add 100-150ml of water, turn the heat up and cover. Simmer 10-15 minutes until tender, then drain off any excess water and mash. Season to taste, crumble in the feta and add the mint, then mix and set aside. 4. Squeeze the courgette between your hands to get as much moisture out as possible. When you've squeezed them as much as you can and you feel you simply can't get any more moisture out...squeeze them again, you wuss. Put a couple of sheets of kitchen towel on a large plate, spread the courgette out on it and place another two sheets on top to further dry out the courgette. 5. Rub together the flours and 55g of the butter for the pastry in a large bowl with your fingertips to create a crumbly mixture. Meanwhile, melt the remaining butter in a pan and then add the water and bring to the boil. 6. Make a well in the middle of the flour mixture and add the hot water and butter and beat until it begins to come together and then, once it's cool enough to handle, knead into a ball. 7. Cut two thirds of the pastry off and cover the rest in foil to keep it warm. Working as fast as you can, roll out the pastry to the thickness of a pound coin and line the tin. Tip in the butternut squash mixture, then flatten down and top with the courgette. 8. Roll out the remaining pastry to just over the size of the base of the tin. Put it on top of the pie and, egg washing the edges, crimp them together by pushing with a finger from each side. Cut two slits in the top and egg wash.
9. Put the pie in the oven for 30 minutes. If you want to decorate it, cut out decorations from any remaining pastry. After the 30 minutes, take the pie out, egg wash the top again and add any decorations, then egg wash them as well to secure them to the pie. Turn the oven down to C and bake for another hour and a half until golden brown, shiny and hot. 10. 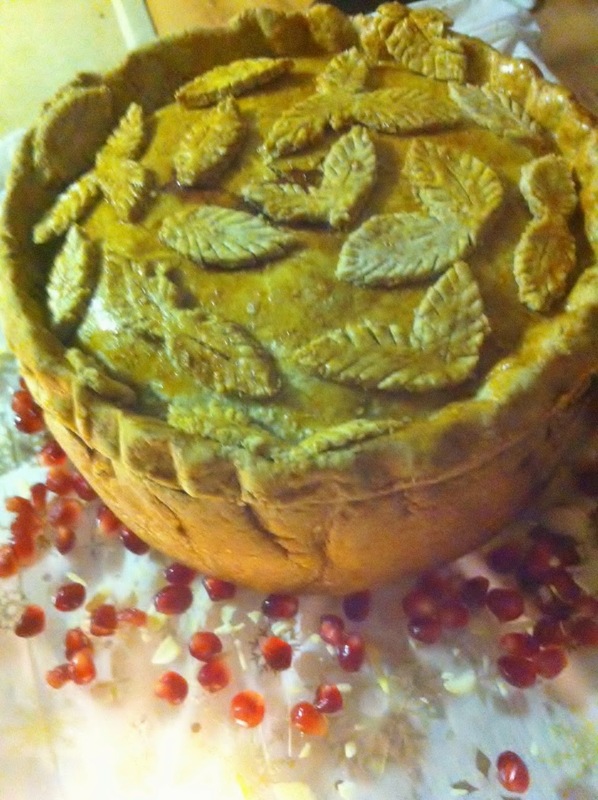 Serve the pie on a large plate, with pomegranate seeds and flaked almonds scattered around it. This week I want to thank Luis Troyano of the Great British Bake Off for retweeting my blog post last week and everyone else who favourited or retweeted it afterwards. You guys are the reason that I still cling to the hope that one day someone with more money than sense will give me a book deal. NB: For an example of an all-singing, all-dancing cake see my New Year's post 2013. Yeah, OK, I was exaggerating about the bunting and fireworks.